Our hostel is of the highest quality on Koh Phangan so that you can come and enjoy the luxury of high class living but with much more engagement with lots of people and the chance to get involved with the many things that we do. Phanganist Hostel is a collaboration between Koh Phangan’s legendary Drop In Bar and the island’s online portal of 7 years Phanganist.com. The meeting of these two island institutions guarantees you the BEST Koh Phangan experience when you stay with us at Phanganist Hostel! Located in the heart of Koh Phangan perfectly between the famous Full Moon Party Beach of Haad Rin and the chilled out vibes of the West Coast, everything is easily reached from Phanganist Hostel and Headquarters. We have pushed the standard of dormitory to an all new high, offering guests clean quality AC rooms with bed separation, privacy curtain, light and power outlet and big lockers, so you can kick back and relax in the privacy of your own bunk. Guests also get 1 free drink at Drop In Bar Haad Rin every night that you would like to go to Haad Rin beach! We also have free BBQs every Full Moon; on the night before Full Moon Party and one on the day of Full Moon. We have a swimming pool complete with large sun deck and sun beds, a poolside bar, pool table and platform space for yoga, dance, fun and shenanigans. We have regular night-time events with the best DJs on Koh Phangan. Cool off with a swim and meet other guests and friendly staff whose mission is to make sure you have the best real Koh Phangan experience whatever desire or direction you want to take. We’re here to help! Drop In Bar was the first beach bar in Haad Rin and will celebrate its 28th anniversary next month, it’s been there since some of the very first years of the Full Moon party and has grown with it in many ways. Owner P Toh took over the family business in 1999 after he worked his way up from cleaning tables and gaining a fascination with music. 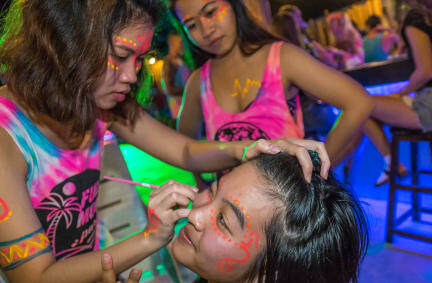 Drop In Bar have some of the best knowledge of Koh Phangan’s most famous event which is the Full Moon Party, they know what you want to drink, what you want to dance to, how to give you the best fun and most importantly how to take care of you. Three years ago P Toh met Sharon the CEO and creator of Phanganist.com at the Full Moon Party! They formed a friendship and Pi Toh enlisted the services of the website Phanganist to help promote Drop In Bar and to take photos of their parties. From the start of the website in 2010 up to today Phanganist.com became well known for its photo coverage of the island’s famous party scene and there are now thousands of galleries with photos from most of the parties on the island. In 2013 it became important to cover all aspects of the island so Phanganist began writing daily articles and interviews with the island’s residents and visitors and on various subjects. Now Phanganist.com serves as the main online portal and magazine for the island with its ethos to show only positivity from Koh Phangan, who needs another negative media source? Not us!